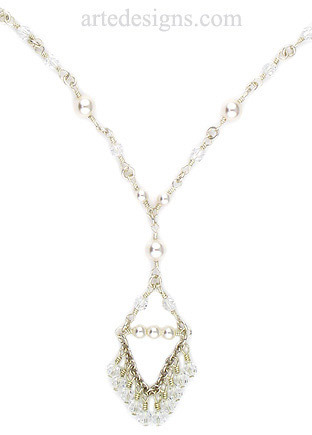 Swarovski Austrian crystals and white Swarovski crystal pearls pair up to create this dazzling unique necklace. Necklace is approximately 18 inches, centerpiece drop is 2.25 inches, sterling silver lobster clasp. Perfect for contemporary Brides. Contact me for an estimate if you need this in a longer length.